Usually stencils are used with paint but there are many other craft projects that can be created with them. For this example we are going to use a single layer stencil to make an applique. Then later we’ll combine this idea with Using Stencils For Quilting! 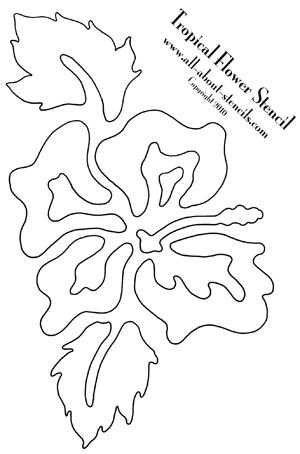 We’re using a single layer stencil of a hibiscus (see below to print). After you’ve created an applique with a single layer stencil you may want to make other more colorful designs. 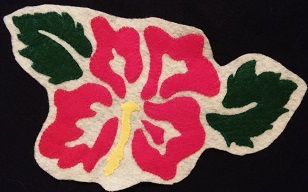 If so read more about Using Multi-Layer Stencils to Create Appliques. By the way, if you want to try a different design other than the hibiscus, check out the Free Stencils on this site. I’m sure you can find an image you’ll love! Once you’ve printed your stencil, draw an outline around the design. This is going to be the pattern for the base of your applique so decide if you want a broad outline or a very thin outline (of course, you can always cut a large outline and trim it to size later). 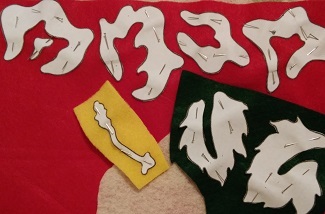 Cut out a piece of fabric with this outline so you have something to attach all of the pieces of the image. This piece of fabric will show up around the outer edges and between the pieces of the image. It’s the background. For this example I used a cream colored felt (you can see in the picture above). Look at the parts of the stencil and think about color options. The enclosed areas of a stencil which are cut out to make openings for paint are called “islands.” The paper left which blocks paint from reaching the surface and holds the stencil together are called “bridges.” It’s the islands that you will use to cut out pieces of fabric. Think of it as a normal sewing pattern and cut the islands out in the color or pattern of fabric for your design. In other words, the petals of the flower may be red and the leaves and stem will be green. Of course, those color options are only suggestions. Go wild and crazy if you want. Patterned fabric is fun to work with too. It’s your design so anything goes! You can attach the pieces of fabric by sewing them on by hand or with your sewing machine. But if you’re not in the mood to sew, gluing them in place will work. Just realize that most glue will make the fabric stiff so if you are going to use the appliques on clothing or in a quilt, try to find a glue for fabric which will dry soft and pliable, not stiff and hard. So, what can you do with this applique? Well, besides quilting, you could sew it on a pair of jeans or a jean jacket, you could use them on throw pillows or curtains, you could sew them on kitchen or bath towels, or maybe embellish a handbag… The possibilities are endless. I hope you find a hundred ways to use this idea and have fun.